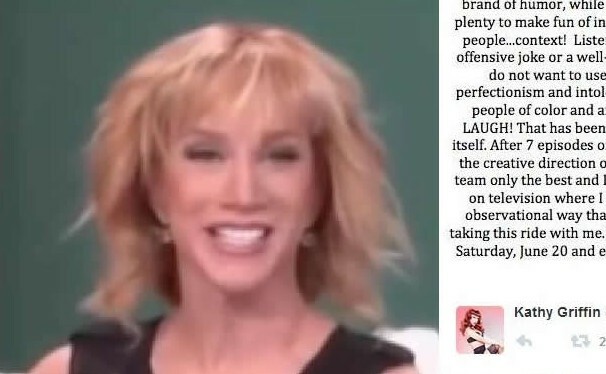 Kathy Griffin has thrown in the towel, quitting "Fashion Police" because she thinks it's too mean-spirited. Griffin just tweeted a treatise, saying, "I thought I could bring my brand of humor to Fashion Police so that beautiful people in beautiful dresses could be teased when appropriate." Griffin adds, "My brand of humor, while unrepentant and unafraid, is all about CONTEXT. There's plenty to make fun of in pop culture without bringing people's bodies into it." 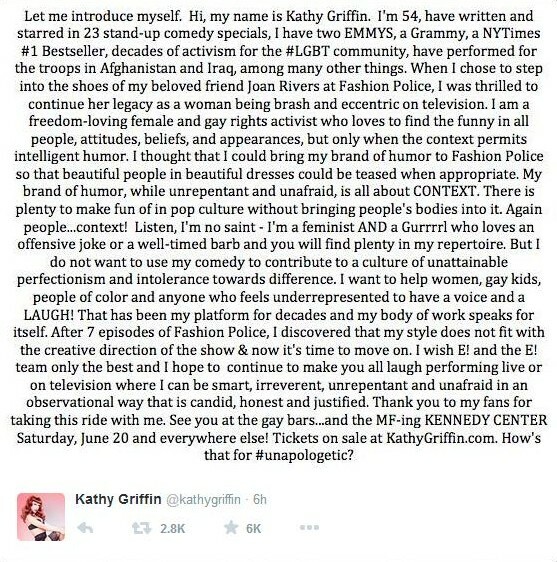 Griffin was not specific on what changed her tune, but she did say, "I do not want to use my comedy to contribute to a culture of unattainable perfectionism and intolerance towards difference." She never mentioned the whole thing with Zendaya at the Oscars, but she did mention in her tweet being a champion of people of color.